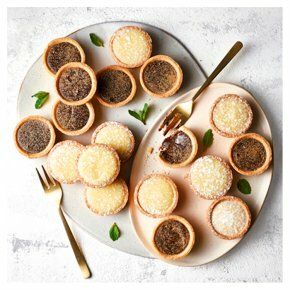 These irresistible tarts are perfect for a party, with a flavour sure to please everyone. INGREDIENTS: fortified wheat flour (wheat flour, calcium carbonate, iron, niacin, thiamin), whipping cream (milk), milk chocolate (13%) (sugar, cocoa butter, milk powder, cocoa mass, emulsifier (soya lecithin), flavouring), sugar, butter (milk), dark chocolate (8%) (cocoa mass, sugar, cocoa butter, emulsifier (soya lecithin), flavouring), hazelnuts (6%), wheat glucose syrup, pasteurised free range egg, sweetened condensed milk (milk, sugar, lactose (milk)), emulsifier (soya lecithin), flavouring, colours (titanium dioxide, iron oxides and iron hydroxides). For allergens, including cereals containing gluten, see ingredients in bold. May contain: peanuts. INGREDIENTS: sugar, fortified wheat flour (wheat flour, calcium carbonate, iron, niacin, thiamin), butter (milk), pasteurised free range egg, cocoa butter, cream (milk), maize dextrose, milk powder, wheat glucose syrup, lemon juice (1.5%), skimmed milk powder, glucose, vegetable glycerine, emulsifier (soya lecithin), cornflour, palm oil, acidity regulator (citric acid), lemon juice from concentrate, flavouring, gelling agent (agar), salt, lemon oil. For allergens, including cereals containing gluten, see ingredients in bold. May contain: nuts and may contain other nuts. INGREDIENTS: fortified wheat flour (wheat flour, calcium carbonate, iron, niacin, thiamin), sugar, butter (milk), whipping cream (milk), milk chocolate (6%) (sugar, cocoa butter, milk powder, cocoa mass, emulsifier (soya lecithin), flavouring), wheat glucose syrup, pasteurised free range egg, milk, cocoa mass, palm oil, partially inverted refiners syrup, milk powder, wheat flour, muscovado sugar, sweetened condensed skimmed milk, skimmed milk powder, fat reduced cocoa powder, salt, cocoa butter, emulsifiers (mono- and diglycerides of fatty acids, soya lecithin, polyglycerol polyricinoleate), flavouring, colours (titanium dioxide, iron oxide, mixed carotenes), stabiliser (pectin), invert sugar syrup, lactose (milk), Anticaking agent (potassium aluminium silicate).